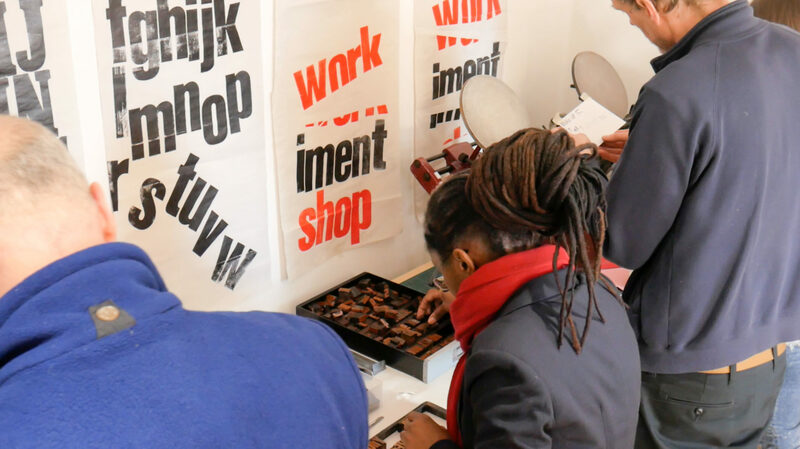 We’ve been doing letterpress workshops for a couple of years now but last month we hosted a new type of workshop which fused letterpress with pressure printing and hot foil. We’d been experimenting with pressure printing for a while and saw potential in creating beautiful background textures to give contrast to the traditional shapes and forms of letterpress printing. 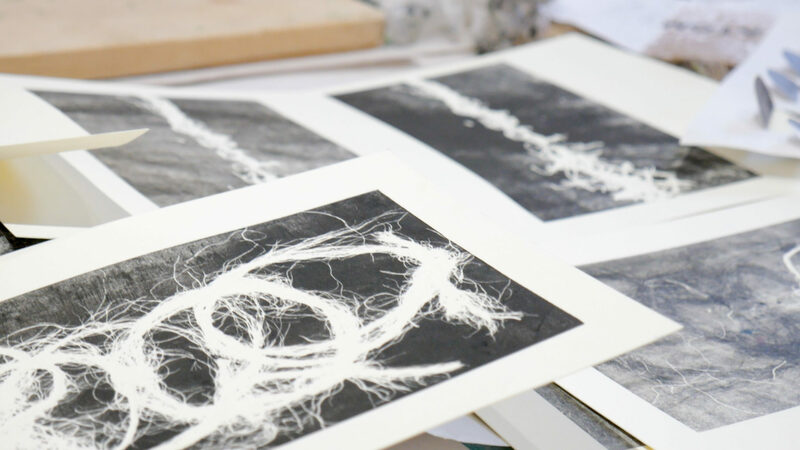 On the day, nine creative folk from varied disciplines, such as photography, poetry, jewellery design, industrial design and illustration, all gathered round our print table in our St. James’s Street Studio not quite knowing what to expect but open to learning something new. After introductions and caffeine infusions we kick-started the creative process with an exercise designed to invoke an emotion and also reveal something personal as an ice breaker. Each person was asked to write down a favourite song or piece of music. We quickly sourced the music and an excerpt from each track was played. 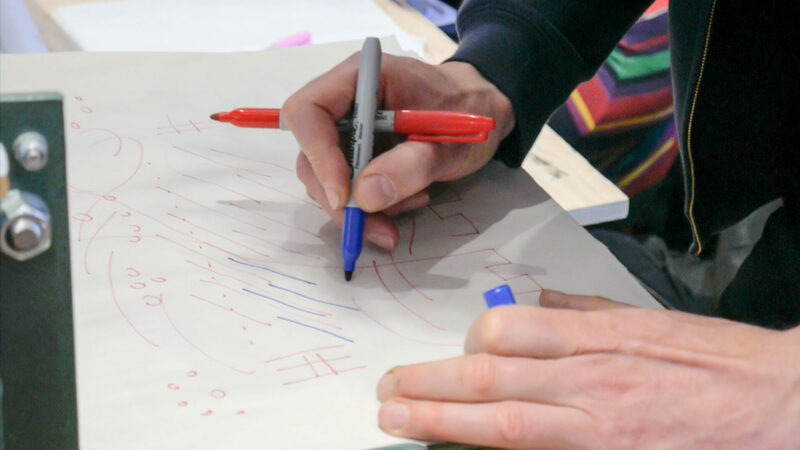 Everyone was given paper and drawing materials and asked to draw any shapes, patterns, textures and even words that came to mind. People were amazingly receptive to the exercise and everyone interpreted their own music and others in interesting visual ways. The resulting drawings were redrawn onto cardboard and the shapes cut out and used to make the pressure prints. 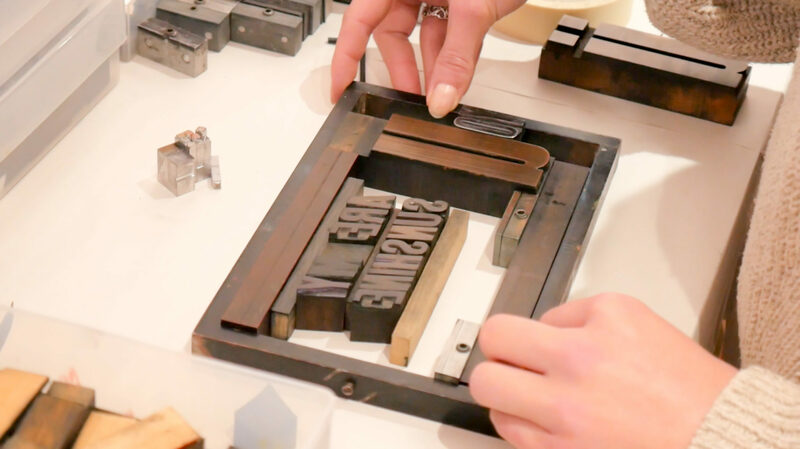 In letterpress, type and printing plates are locked up to make a forme, the surface of the forme is coated in ink and pressed onto paper. 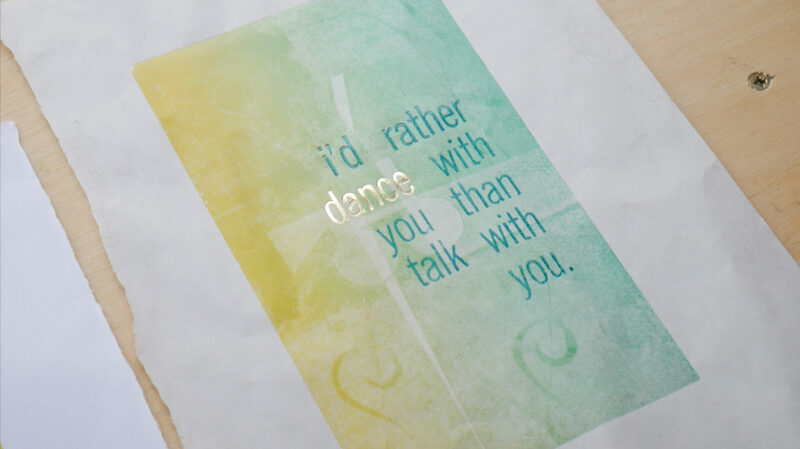 The textures are crisp and solid with metal type and printing plates and often grainy and textural with wood type. 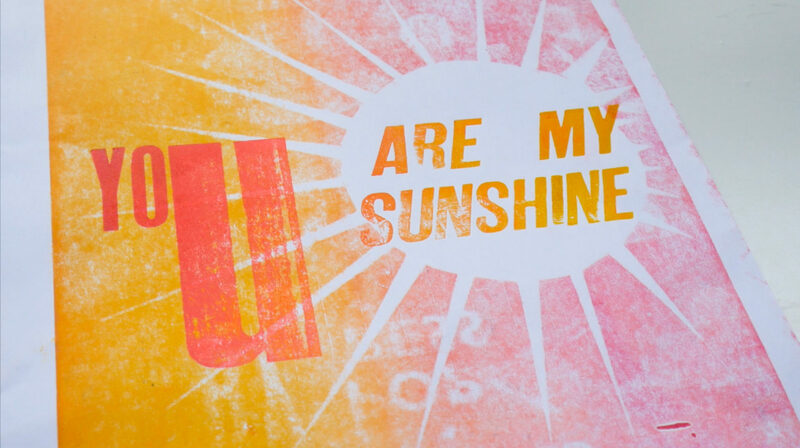 With pressure printing, a printing block or type base is coated in ink and paper is placed on top. Then on top of the paper, cut cardboard shapes or other thin objects or materials are placed (we also used dried leaves and flowers, elastic bands, string and spaghetti). When pressed, most of the ink is pushed onto the paper where the objects lie, but some ink is also deposited on the other areas of the paper making lovely ethereal textures. Another dimension was added to some people’s pressure prints by using two colour gradients. We have some extra long rollers which are perfect for this! Others preferred monochromatic colour schemes which looked just as effective. In fact one of the most successful prints was achieved by simply pressure printing frayed string with black ink. People were also using our wood and metal type collection to create unusual and challenging lock-ups. Some continued on the theme of lyrics used in their favourite music while others focused on inspiring words or sayings. These locked up formes were mounted into our Adana table-top press or our antique Golding Pearl treadle press and overprinted onto their pressure prints. A few brave people used our foil blocker to add a final touch of shine to their words of wisdom. 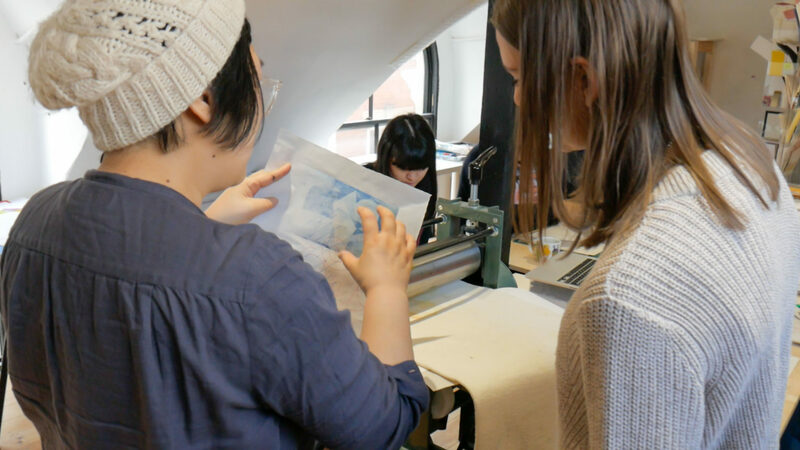 Foil block printing is similar to letterpress, but the locked up forme must be made of metal components or conducting material as it is heated to over 100 degrees celsius and presses a thin metallic foil onto a substrate.